Wearing a semi-happy-semi-anxious smile, I climbed onto the plane to Sri Lanka, which Srishty and I for a span of 2 months referred to as “Home away from Homeland”! We were not even done eating when we landed in Colombo. All the while the popular airplane read “Once Discovered, you must explore” and had me fairly engrossed and largely tempted. Upon arriving, here in the airport, amongst many other smiles, the border official greeted me with a giant smile and unhesitatingly stamped my passport, I with my wide eyes, swaying gazes, wondered that people around look so much like me. It felt like my home country! Nothing, and trust me on this, reinforces your sense of having arrived in Sri Lanka quite as much as the question ‘Indian’? Yes, I murmured, eagerly! Say a word and your pronunciation is a dead giveaway of your “local” or “tourist” status. Pretending to know and pronounce the names of streets and landmarks just like Sri Lankan’s do hardly works here. 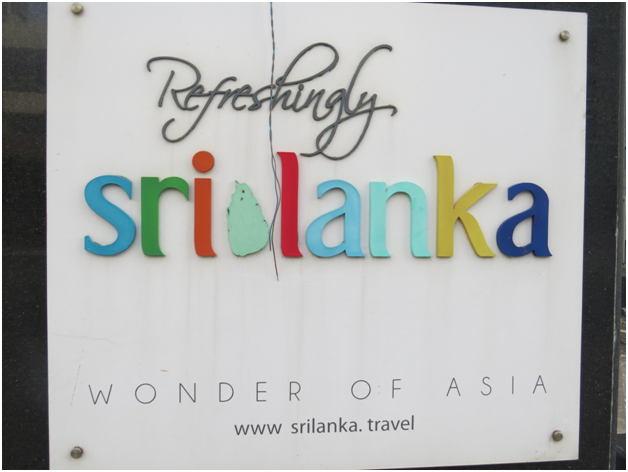 I remember how one tuk-tuk guy recognized us by the bargain abilities we showed him while returning back home in Colombo. Without the slightest doubt while collecting money, he asked “Mumbai or Delhi”? Indians are popular for a reason! For the first 3 days, we chatted away about the possibilities of a full-fledged three-day excursion. 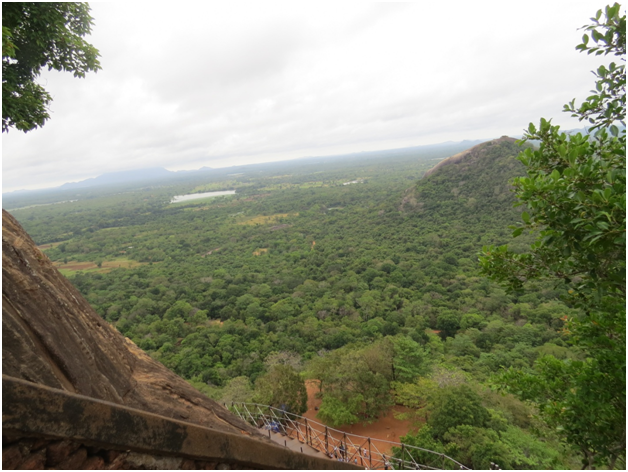 Upon asking, our colleagues gleefully urged us to visit the ancient cities and ruins of Polonnaruwa, Dambulla and Sigiriya. All together they make the Cultural Triangle, geographically situated in the central province of Sri Lanka. Our colleagues continued to emphasize that Sri Lanka is small enough (yet diverse) to get around everywhere in a day (provided you don’t mind standing in the train). We remained abnormally intrigued about whatever was being told to us and we pretended to agree to make the clichéd “cultural” leg as one of our first trips. I would be lying if I told you that we didn’t do a toss-up between staying back in Colombo and heading for the backpacker-style weekend. Just as we were bordering on losing interest with the idea of exploring ancient cities, Google made us believe that is an absolutely vital part of a visit to this country, moreover various searches assured us of its global reputation. 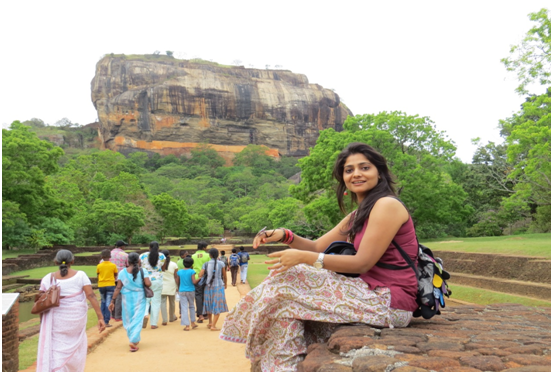 Sigiriya Fortress – the 8th wonder of the world. It had us instantly suit up for the move. As a drizzle led to droplets to a downpour, we wheeled our way through crowded market places to dusty plains and chaotic urban scenes. 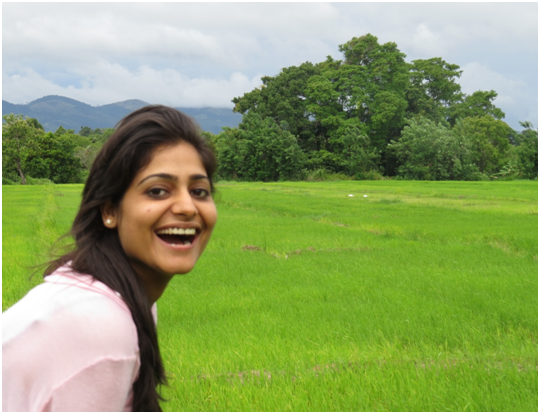 After the seemingly long way, my excitement broke out as we drove along parrot green rice fields, bottle green mangroves and blackish green coconut groves. It was like a buffet, laid out to whet our palate for more. Only when we could not resist the wind-caressed palms and the gleaming shades of green, we dragged ourselves amidst the paddy fields and obsessively took pictures of practically everything. I remember the breeze we felt when the winds ruffled our hair while we clicked and clicked. From afar, our driver pointed to the giant lion-like carved stone, surrounded by infinite greens and blues, and warned us that the climb can only happen if the path is dry. Luckily clouds did not shed much of their precious water at the pre-during-post ascent and descent. We watched locals and tourists lacing up their sneakers tightly for the ascent. The realization and regret of not wearing shoes came much later to us, precisely when we were past the gentle and evenly spaced steps. 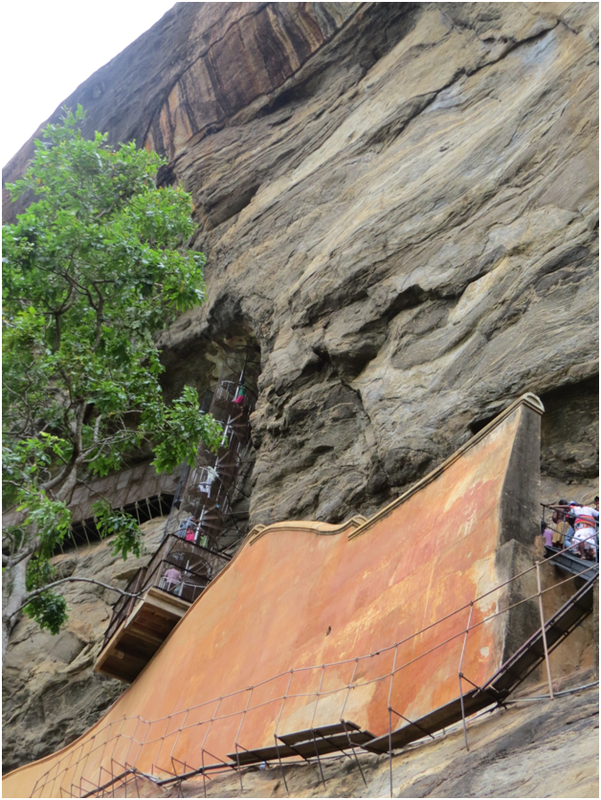 Looking closely at its height and then at its snaky and uneven stone steps, we approached a grandma-aged lady to ask how many steps we would be ascending and she said with child-like enthusiasm only 1200 steps! We comforted each other with Steps-are-not-what-I-do-best- besides- we-are-in-no-rush! 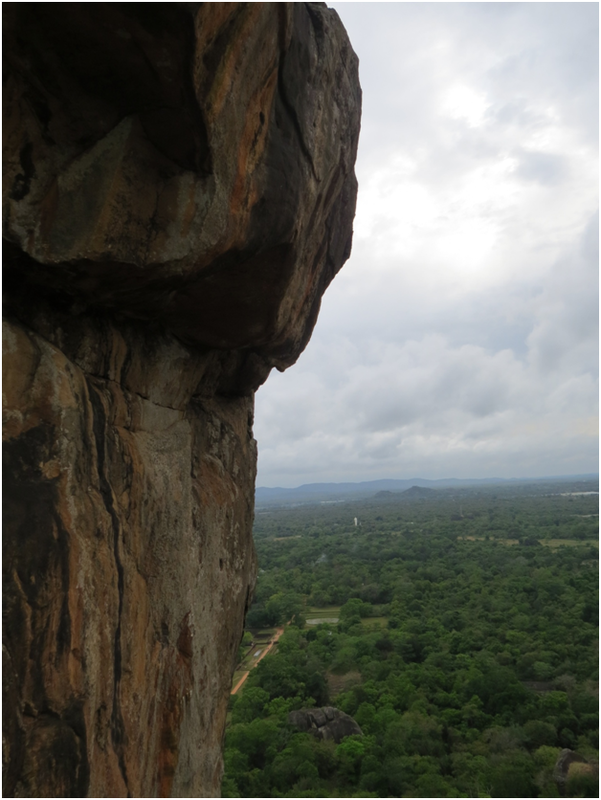 We did a rough calculation, 3 hours to climb up and it should not take more than 2 hours to get down. With this note, we continued to move at a pace befitting our stamina. Every 15 steps we would stop to let the wind wrap us; enjoy the feeling of being so high up and also for more than a few picture stops. No matter how many steps climbed, the summit still seemed far away. Much to our relief, after about 2 hours of climbing, the top did seem to be getting closer. On the last stretch it was becoming difficult to balance ourselves on narrow iron steps against the gust of wind that shook our body with every move. But no matter how scary it got to look down we didn’t mind the momentary fear. Srishty climbed the last step and I was still struggling to find a safe place to be able to position my camera and get a picture clicked. I moved ahead and it felt so good to take that last step. PHEW! The top offers you an aerial view of the entire town, the villages beneath look like a display in the school science fair that has a neat village with patches of green for fields, a wavy road running across and a river flowing forth. It is a sight to behold!!! Don’t overestimate yourself if you turn philosophical or poetical or a photographer for that matter, marveling at the green mountain peaks, at the panorama of unusual sights that unfolds before you and I bet, you would behold the treasure troves of myriad sights to regale your friends back home. Without any hint of rush, we started to descend, carrying a wow experience under our belt and happily ticking off a place from our bucket list. Next Post CHRISTMAS HOLIDAYS IN ASIA: 3 GOOD REASONS TO ORGANIZE NOW!